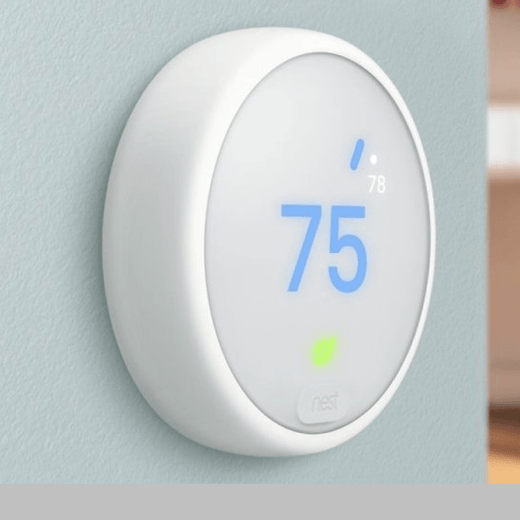 Meet​ ​the​ ​easy-to-use ​energy-efficient​ ​control-it-from-everywhere​ ​Nest​ ​Thermostat​ ​E.​ Instead​ ​of​ ​a​ ​bold​ ​design​​,​ ​the​ ​Nest​ ​Thermostat​ ​E​ ​and​ ​its​ ​frosted​ ​display quietly​ ​blend​ ​into​ ​the​ ​home.​ ​This​ ​new​ ​display​ ​diffuses​ ​the​ ​light​ ​from​ ​the​ ​screen, ​so​ ​users​ ​see softly​ ​glowing​ ​text​ ​and​ ​graphics and​ ​a​ ​simplified​ ​interface that is​ ​easy​ ​to​ ​read.​ ​When​ ​it’s​ ​off,​ ​the​ ​frosted​ ​display​ ​takes​ ​on​ ​a​ ​glacier-gray​ ​color​ ​and​ ​fades​ ​into​ ​the​ ​background. It has the same energy-saving effectiveness as the Nest Learning Thermostat. The Nest Thermostat E builds off its predecessor’s success by being less expensive and less obtrusive in the home.